Latitude is considered by many (including me now) as an essential event within the UK festival circuit. As a four-day shindig with around a £200 price point, capable of reeling in the very best musically, it definitely slots in with the likes of Glastonbury, Reading/Leeds and Bestival. Another almost-cliche phrase coined in festival culture, often applied to Glastonbury, is the idea of ‘it’s more than a music festival’. Latitude is promoted as such, with offerings in not just music, but theatre, art, comedy, film, poetry, literature and cabaret too. Early opinions of Latitude were mixed-to-disappointing. Having travelled for four hours from Bristol to Suffolk, via the tube, with bags of camping equipment and booze, the last thing in the world I wanted once I’d arrived on site was a, to wait, and b, to catch any other mode of transport. The shuttle bus dropped us at what I assumed were the outskirts of the festival, and when asking a member of staff how to get to yellow camp, he said ‘you can walk around there, but there might be a fence so might be pointless, or you can wait here where hopefully a minibus will come, but people have been waiting for ages and the minibuses have been erratic all day’. Cheers then. We waited for a ridiculous hour and three quarters, when finally a minibus came and took us to the entrance. However, let me stress, we were at the front of the queue and it took this long for the first bus to arrive, people behind us would have waited even longer. Either way, finally we picked up our wristbands, found the rest of our clique, set up our tents and had a beer. However, I still wasn’t that much happier about being at one of the UK’s biggest festivals. And then we went into the arena. I’m not exaggerating when I say Latitude is absolutely picturesque; incredible art installations, beautiful incorporations of nature-meets-contemporary design, the integration of the sublime Suffolk countryside, all wrapped up in the glorious British sunshine. 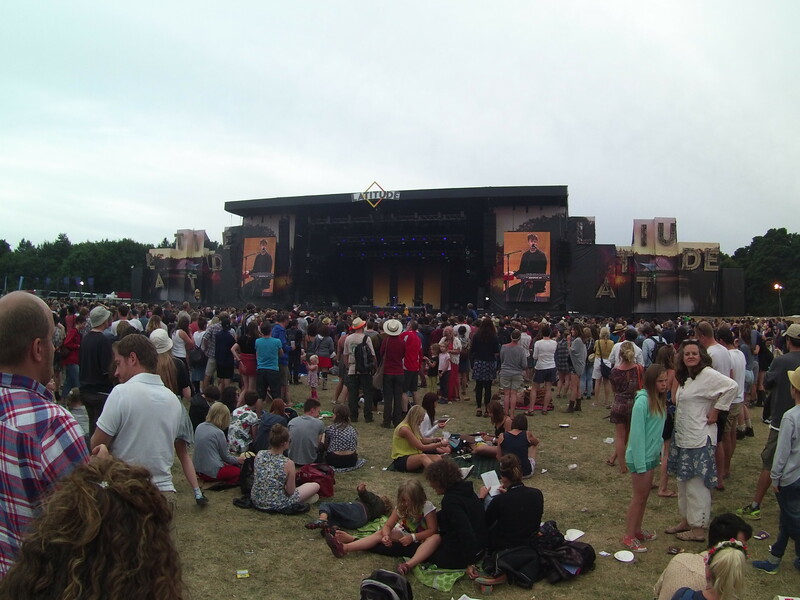 Latitude’s image, aura and appearance is up there, probably even better than Glastonbury and Sziget. 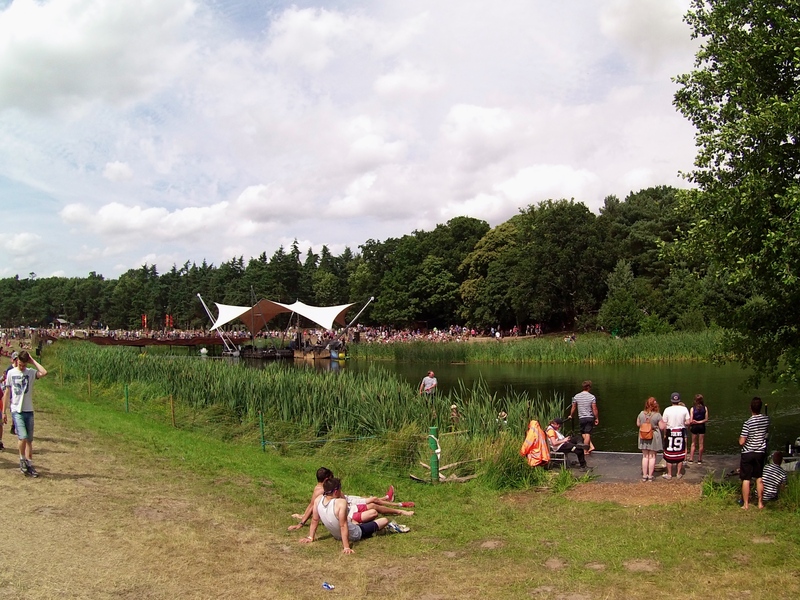 Besides the visual set up, Latitude’s vibe and subsequently its attendees are just as pleasing. Featuring every age from newborns to the pushing-on-80s, the entirety of patrons coincide effortlessly, resulting in a calming high-spirited eco-system of festival-goers who are all just here to have a good time. There’s no bad blood, no malice, no ill-feelings or anything that isn’t well-meant. Latitude is all peace and love. Latitude’s utilisation of its epitomising British countryside is one of its selling points. While the bulk of the event is set on lush green hillsides, a shimmering lake-come-river weaves its way through the festival and is expertly incorporated. A stage that actually sits on the water itself is nothing short of genius, and having complimentary boat rides and the added option to go for a refreshing swim, all in the bright British sunshine, it’s something to give the organisers serious props for. As well as the lake, the woods are also a USP, by day a chill-out area to escape the sun and watch fresh faces at the iArena, by night it transforms into a neon-lit rave area brimmed with incredible artwork, installations, and late-night DJ performances. Going back to the ‘more than a music festival’ selling point, that it certainly is. With a booming comedy tent featuring the best of British comedians such as Alan Davies, Jon Richardson and Jack Dee, a stellar assortment of poets including Dr John Cooper Clarke, and an extensive cabaret, theatre and literature lineup, to use the cliche, ‘there really is something for everyone’. I have very few criticisms of Latitude, my arrival was frustrating and pretty unorganised, but easily forgotten. I also have a small complaint in regards to security and staff and their understandings of myself representing the press. Armed with a press wristband, my privileges as such were unclear throughout the whole event. Some security let me into areas with open arms and a smile, some raised eyebrows and walky-talkied their superior, and others flat out refused to even listen to me, even though on one occasion they’d previously accepted my band earlier that day. Another slight qualm is that the stages are slightly too close together, while watching Sunday night headliner Noel Gallagher at the Obelisk Arena, I could hear SBTRKT’s Radio 6 Tent set over a lot of the ex-Oasis frontman, which was actually really frustrating. Latitude is an incredible festival, one I hope to attend every year from now on, and one I cannot recommend enough. While the [fairly] niche musical lineup won’t be everybody’s cup of tea, like myself, the rest of the festival’s attractions are enough to take yourself along. I could be here praising the festival all night so I won’t go on any further, but let me assure you, you must give Latitude a go.